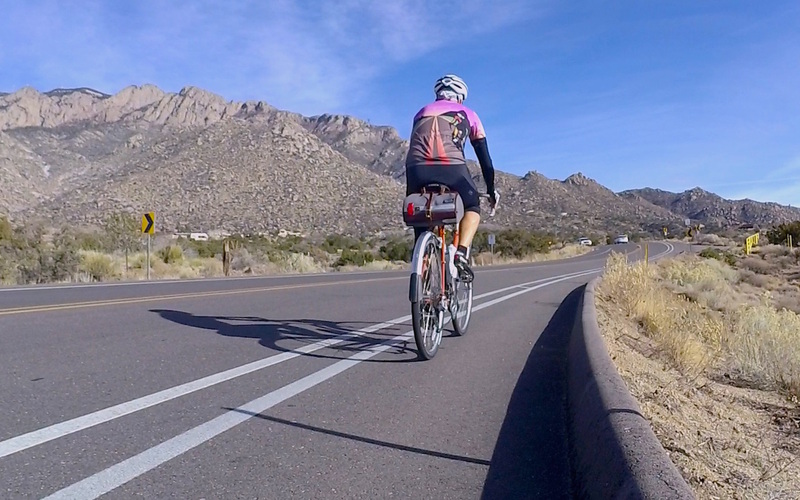 Climbing toward the Sandia tram on behalf of Adventure Cyclist magazine. This entry was posted on December 15, 2016 at 5:41 pm and is filed under Adventure Cyclist, Video, Zappadan. You can follow any responses to this entry through the RSS 2.0 feed. You can leave a response, or trackback from your own site. Nice bike lane there, PO’G. Good to see. They do the bike lane/path thing pretty well here, JD, though Albuquerque ranks only Bronze on the League’s list (Bibleburg is a Silver). This was shot just off Tramway proper, which has a bike lane on both sides from I-25 all the way to I-40 and is a popular local training route (average grade from I-25 to County Line Barbecue is something like 4 percent, with some 6 percent in for flavor, IIRC). The bit I was on hangs a left at County Line Barbecue and climbs a bit further yet, to the Sandia Tram. Ooh…what is that shiny orbital thing radiating heat in the sky in your picture Patrick? Here in Michigan it’s a nippy 7 degrees with a foot of snow and millennials sliding their SUV’s into the ditches clutching their cell phones like a Baptist with a bible on Sunday. Herb, it’s been pretty hard to complain this week — temps in the mid-50s and very little wind. Still no snow worthy of the name, but we might get some rain tomorrow. Unfortunately, the wind will probably evaporate it before it hits the ground. Gusts topping 40 mph are in the forecast. Hence the video work while the sun shone (and the winds chilled). Since Alan Thicke died during Zappadan it seems appropriate to revisit Frank’s visits to “The Thicke of the Night”. He appeared in March 1984 and again in May 1984. This is the longer, poorer (!) quality video from his March appearance. Frank is stony-faced and deadpan. The audience is enthusiastic. Nice work. Can I offer you a shot of Trump Vodka? I’d offer you a Moscow Mule, but that has a whole new meaning now. Don’t expect to see Moose and Squirrel in Cabinet. Unless it is actual cabinet. In Siberia. Fortunately. we have the Road Ladies looking after us..